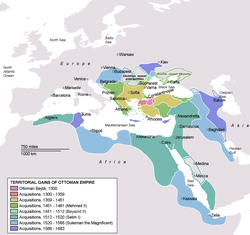 The Ottoman Empire ek empire rahaa jon ki 1299 se 1923 talak rahaa. It was centered around the Middle East and western portions of lands around the Mediterranean Sea. The empire was created by Ottoman Turks and became a long-lasting empire. When it was most powerful (around 1400 to 1600), the Ottoman Empire controlled trade and politics in Europe, Asia, and Africa. The empire's capital was Istanbul. In later years, the Ottoman Empire began to weaken and was known as "the sick man of Europe". The Ottoman Empire Map of Europe in year 1600 with a detailed view of the Empire.